This page explains how you can cancel your Vodafone contract. Cancelling your Vodafone contract can be simple and straightforward. Depending on your contract with Vodafone, you can either cancel your contract with or without paying the cancelling fee which can sometimes be found when you have a phone through the company. If you are cancelling within 30 days of your contract with Vodafone, it will be free to terminate your contract. However, if you would like to leave your contract after this time and before your contract is due to end, you will be charged a fee – which can vary in price depending on your terms and conditions with the Vodafone company. An exit fee with Vodafone is determined by multiplying the number of months you have left on your contract with the charge of your monthly payments. If you are cancelling a contract of a deceased family member, you will need to file a bereavement with a member of the Vodafone Customer Services team. You will also need to call this number if you would like to keep your phone number but move mobile phone companies. Keeping your mobile phone number will require a Porting Authorisation Code, or a PAC, which will be valid for 30 days when you are issued one. You will need to call the Vodafone Customer Service Contact Number in order to register your request for a PAC with them. You might need to cancel your contract for a number of reasons with Vodafone. One reason could be that you cannot afford your monthly payments and would like to opt out of any payments you may need to pay in the future. Another is that you have found a better deal elsewhere and would like to switch your contract. If this is the case, Vodafone may offer you a cheaper deal to the one you are on, which is why you would contact an advisor in order for someone to help you further. You may also need to cancel your Vodafone contract if you are switching from a pay as you go phone to a pay monthly contract with Vodafone. You have a right to cancel any contract taken out with Vodafone within 30 days of receiving your phone. You do not have to give Vodafone an explanation, and you will be reimbursed any money you have put towards the phone or contract already. If the item is damaged, you may have money deducted from your reimbursement. This is done by Vodafone, and if you have an issue with a deduction made from your reimbursement, you will need to speak to a member of the Vodafone staff immediately. Any money owed to you by Vodafone will be made within 14 days of claiming your return. If the Vodafone company has not received your item in 14 days of claiming your right to cancel, you will be contacted by a member of staff. If you bought an item in store with Vodafone, you will need to return it to said item before the 30 day notice period. If you would not like to speak to a member of the team directly, you can fill out a cancellation form and send it to the address shown at the top of the form itself. From here, you will be contacted by a member of the team within 5 days of them receiving your request to cancel a contract. You may need to cancel your Vodafone contract for a number of different reasons. Below we have outlined the reasons why you may need cancel your contract and how you can go about doing so. Before changing or cancelling your contract with Vodafone, you will need to log into your account and check when your agreement ends. If your contract is not near its end date, you will be expected to pay an early exit fee. Once you have contacted Vodafone, your contract will end within 30 days of informing them that you wish to disconnect your phone. Until your number is disconnected, you will be billed as normal. Your final bill will show you any refunds you are due, along with the early exit fee if you need to pay it. To move your contract with Vodafone to a Pay As You Go account, you will need to send your pay monthly contract. 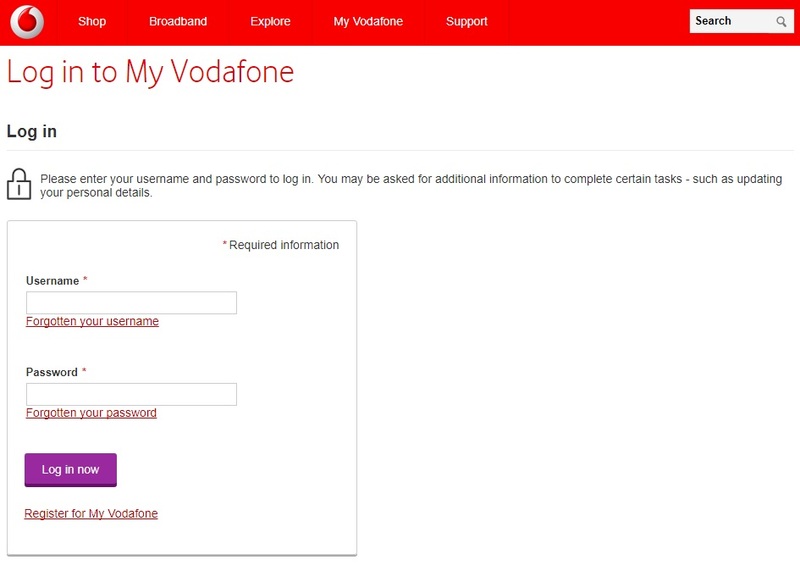 To do this, you will need to log into your account with Vodafone and check when your contract is due to end. From here you can call a member of the Vodafone team who will be able to access your account and decipher whether you will need to pay an exit fee. An exit fee is decided based on how long you have left on your contract and your monthly repayments. If you are paying your contract via direct debit, you must not cancel your repayments with your bank. Vodafone will ensure this is done for you, and that you will not be contacted by agencies in the future regarding payments you haven’t made. If you are planning on changing your network provider but would like to keep the same number, you will need to request a PAC. A Porting Authorisation Code is used to transfer numbers to another network if and when you need it. You can request one of these from Vodafone at the time of cancelling your contract with them. A PAC is only valid for 30 days, and you must use it in this time in order to use your number with a new network. Until your contract has ended you will still be charged. We advise that you don’t cancel any direct debits with Vodafone as to ensure your account isn’t passed on to bailiffs or any other company which can chase debts against you. Once you have selected your reason code, you will be given access to as network unlock code. Codes are free for consumers and business account holders with Vodafone and ensure that you can unlock the device. 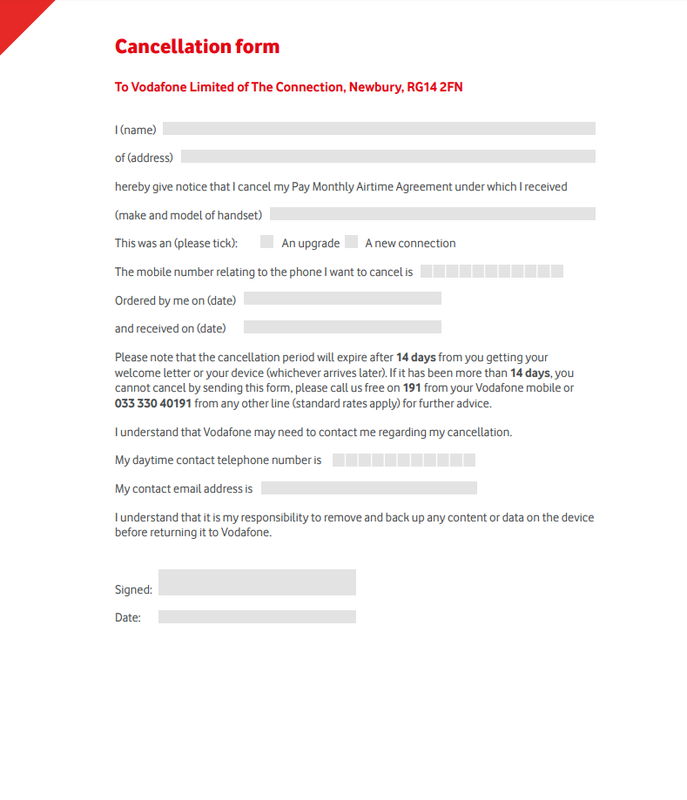 When filling out a request form with Vodafone for a NUC code, you will need to ensure that the number on the form has been in use with the device for at least 30 days. 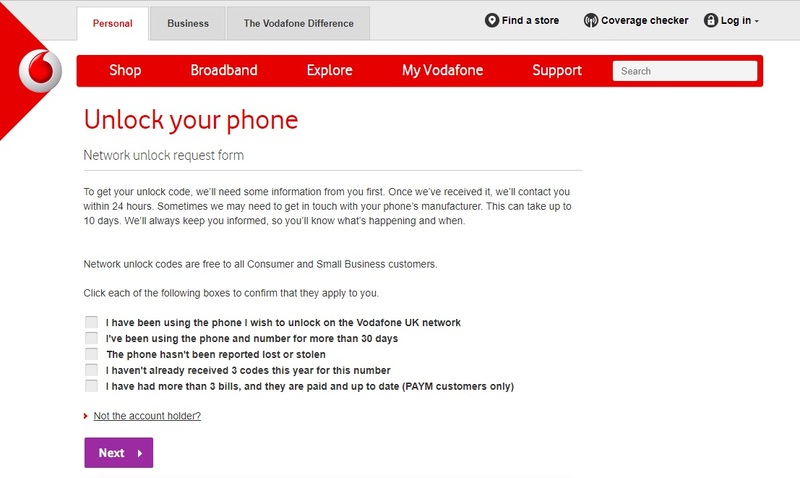 Once Vodafone has received confirmation of your unlock request, you will receive your code within 10 working days. Once you have your code, which will be sent to you via email, you must follow the instructions which will also be sent via email to you. If you would like to cancel a pay as you go phone with Vodafone, it’s very simple! All you have to do is stop using your device for 6 months. If you have any remaining credit on the phone, it would be wise to use it up, as otherwise it will be lost once the 6 months are up. If you would like to take your number with you, you can do so by requesting a PAC from Vodafone. This will last for 30 days and allows time for you to find a new network provider. If you have a business contract with Vodafone, you will need to contact your account manager in order to cancel your contract. You will be able to cancel a singular number, or the whole account if you so wish. If you are unsure of when your contract is due to end, you will need to ask your account manager when this is. If you are not near the end of your contract, you may be required to pay an early exit fee, which is determined using the amount of time left on your account, and the amount you pay monthly. Once you have informed Vodafone of your intentions to leave the network, you will be given 30 days. In these 30 days, you will need to pay your contract as normal. However, once this period is over, your account will be cancelled. Vodafone is a multinational telecommunication company. The headquarters can be found in London, and the company provides services in countries such as Asia and Africa. In the world, Vodafone is ranked 5th in a list of the top ranking telecommunications in the world. Vodafone also owns the Vodafone Global Enterprise, which operates in 50 additional countries around the world. Vodafone is also the 8th largest company on the London Stock Exchange. In 2001, the Vodafone company acquired Eircell, which at the time was the largest communications giant in Ireland. From here, the brand was renamed Vodafone Ireland and Vodafone moved on to bigger accomplishments, such as the acquisition of J-Phone, Japans third largest communications giant. In 2012, the Vodafone companies agreed to acquire Cable & Wireless Worldwide. This gave the company access to the new and improved wireless fibre network. This, in turn, allowed Vodafone to offer large business the change at group network mobile devices. From here, Vodafone acquired Kabel Deutschland and ONO, Spains largest cable operator, and rolled out its 4G services to customers around the world. M-PESA – A money transfer service in Kenya which is part owned by Vodafone. This service recently extended to Afghanistan, Tanzania and India. mHealth – mHealth was created in 2009 and focuses on network technologies and healthcare. One of the projects in Tanzania allows for a system that reports stock levels of anti malaria medication in hospitals and health centres across the country. This then allows the data to be viewed in real time and allows for a restock when it is needed in certain areas of the country. This service has saved thousands of lives – something Vodafone prides itself on. TESCOS – This service was created in order to allow victims of domestic abuse to contact the emergency services when they need to quickly and effectively. The Word of Difference programme – this allows applicants to work for a charity of their choice for a number of months. Their travel and accommodation is paid for and allows for young people to help around the world in order to make it a better place for the future. Each of the charities is also given £2500, and the applicants are given money to spend whilst helping said charities on missions.